Inhabited since prehistoric times, Olympia remains best known as the site of the original Olympic Games, held there for the first time in 776 BCE. Ancient Olympia has been added to your itinerary. To see other places to visit, traveler tips, where to stay, and more tourist information, refer to the Olympia driving holiday planning app . Athens to Olympia is an approximately 4-hour car ride. You can also take a bus; or do a combination of train and bus. Expect a bit cooler evenings in Olympia when traveling from Athens in August, with lows around 22°C. Finish your sightseeing early on the 29th (Wed) to allow enough time to drive to Athens. 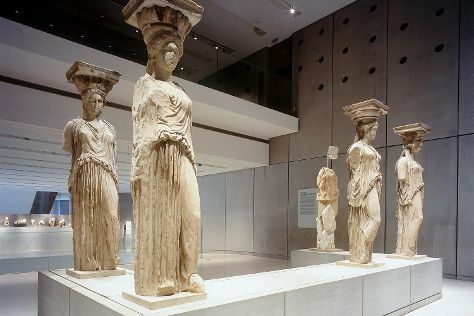 National Archaeological Museum and Acropolis Museum will appeal to museum buffs. Popular historic sites such as Acropolis of Athens and Erechtheion are in your itinerary. There's lots more to do: wander the streets of Plaka, tour the pleasant surroundings at Glyfada Beach, contemplate the long history of Ancient Agora of Athens, and pause for some serene contemplation at Ekklisia Agia Dinami. To find more things to do, traveler tips, other places to visit, and other tourist information, read Athens road trip planning site . You can drive from Olympia to Athens in 4 hours. Alternatively, you can take a bus; or do a combination of bus and train. Traveling from Olympia in August, expect somewhat warmer with lows of 29°C in Athens. On the 1st (Sat), you'll have the morning to explore before heading back home.